HT: Glad to hear of your new position. HT: So are you from NYC? GA: Yes, I am. From Brooklyn. Born in St. Albans. I lived in Queens until I was ten/eleven years old. Then we moved to Brownsville, where I stayed until I went to college. I went to NYC Technical College in downtown Brooklyn and then I transferred to Virginia State University, in Petersburg, VA, for my undergrad. HT: So tell us a little about yourself and growing up in NYC. GA: My parents met in high school. (My mother’s) parents went to Hampton University, and my father’s parents (went) to Virginia State. So I was the second generation to go to Virginia State University. My entire family grew up in NYC. In fact, my uncle and aunt and cousins are still here. My brother and sister both went to Howard and stayed down in the D.C area. Both my wife and my wife’s family are also from Brooklyn, and migrated down to the Maryland and Washington D.C./ Northern VA area. HT: Terrific… tell us about elementary school. GA: So for elementary school, I went to PS 36, which is on Lyndon Blvd., in Queens, and Abraham Lincoln High School in Coney Island, and then switched and graduated from South Shore HS. HT: At The Harlem Times, our goal is to bring teachers and students up to date on the latest in STEM education and technology. Picatinny has played a tremendous role in this pursuit, as well as The Harlem Educational Activities Fund, began by one of our founders, Daniel Rose, whose goal is (to) have 100 percent of his students attend college. Can you tell us about someone who has influenced and inspired you? GA: Good question. I will go back to my time in NY, where I will say that I was finding who I was, and finding who I am, while in high school. While in high school, I had a chemistry teacher by the name of Mr. Alper. I remember, that because I was not truly focused on the studies, that one day my mother had to come to school and had a parent-teacher conference with Mr. Alper, (who) stated to her succinctly that I was intelligent, but that I just did not apply myself, it’s simple as that, and that my study habits needed to improve. It was a simple sentence. But the intricacies behind this statement in terms of aligning with that statement and executing that statement (are) difficult and challenging in terms of being a youth in the city, and coming from a single parent household at the time presented its own unique challenges…yet we were able to persevere. This was the first time that I paid attention to what the teacher was trying to convey to me in terms of helping me along. If I go back in time, of all those opportunities and all those events, that have shaped me, (I) would have to say that my mother has been there 100 percent of the time. You talk about teacher and not necessarily in the classroom, but even in the home, even in terms in carrying myself in the community, it has really been my mother. HT: Can you tell us a little about her? GA: My mother had a quote that I say when I talk about her which is a true statement and I will say it the way she said it me. She says, “Baby, I don’t play, I provide play.” So, putting this in context, I have a very informal and jovial personality. My mother will say that she does also, but I’m not quite sure. She may (be) softening up as she gets older, but I did not see it when I was in high school. Growing up in Brownsville during that time — late ’70s and early ’80s — was significantly different than growing up in St. Albans, Queens. It was different in that it was more challenging. And although we grew up in these critical years, I always knew that the neighborhood was the neighborhood. But once I crossed the threshold of my front door, I was in a different world. And my mother kept it that way. And it was good…she did not stop us from interacting with our friends, or establishing friendships and being part of the community, but there were expectations that she maintained once we crossed her threshold. I will tell you another story about my mother. I was a Captain, that might have been 1993. I remember once saying to one of my friends on base at the time (Fort Lee, VA), that I grew up in the ghetto, and my mother, who happened to be visiting at the time said, “No, you did not!” I didn’t understand that at the time. I said that I grew up in Brownsville, I would not define it as a ghetto, and her response was, “Well, you did not grow up in the streets, you grew up in my house!” I took me some time to accept that; it’s a very true statement. Again, I didn’t get it then. But, over time, I understood what she was talking about. So I guess in your mother’s house you developed a love of chemistry under the tutelage of Mr. Alper? GA: Chemistry and I have a love/hate relationship. Going to college, I was not sure what I wanted to do and study. So the traditional way was to go undeclared and take a few liberal arts classes and figure it out from there. But in my mind this was a waste of time. I reasoned that if (I) go to college, let me study something what gave me the most difficult time while in high school. Right, wrong, or indifferent, the only reason why I chose chemistry to study (was) not because (of) the love of it… it is because it posed my biggest challenge. And I was going to beat that challenge. And, over time, I begun to appreciate it a little bit more. HT: So, in your studies, you chose to steer towards the hardest things? GA: Go to the hardest things. So in terms…(of) a competitive nature, at the time, if something … was beating me,… (of) all my high school grades, it was probably the one I was suffering the most. If I was to go to a higher level of education and more focused learning, let me go focused on my greatest challenge. I can honestly say that was the sole reason why I chose chemistry. HT: This is similar to The Harlem Educational Activities Fund: focus on the hard subjects: the things that challenge the most, then other things will become more manageable and learnable. A great philosophy. So with your chemistry background, did you ever consider a career in industry? GA: Not necessarily industry, but I do have a desire, at some point, once I get off the military train, to do some form of education. At what level, I’m not sure. Giving back to the community has always been important to me; in what capacity, I’m not quite sure. So, within the military, the opportun(ities) to have different types of jobs always present themselves. So, that being said, I had the opportunity to be an instructor: I taught about chemical warfare, that’s the closest that I get to chemistry. But I really did enjoy that job. Talking to kids, those that were younger than me, and fielding questions. This served two purposes: it required me to be committed to my craft, meaning that I had to know my subject so I needed to be devoted to it and understand the intricacies behind it; also the challenge of getting questions I could not answer immediately — that was a motivating factor for me. It happened to me a couple of times, I welcome when that happens because it required me to go back and do a little more research. “Why don’t I know this?” I liked that venue, if you will. Giving information, providing information, instructing and passing on information, and getting questions from a particular angle that I might not have been thinking about. I like to get challenged this way. HT: So when did you make the decision to join the US Army? GA: A good story. 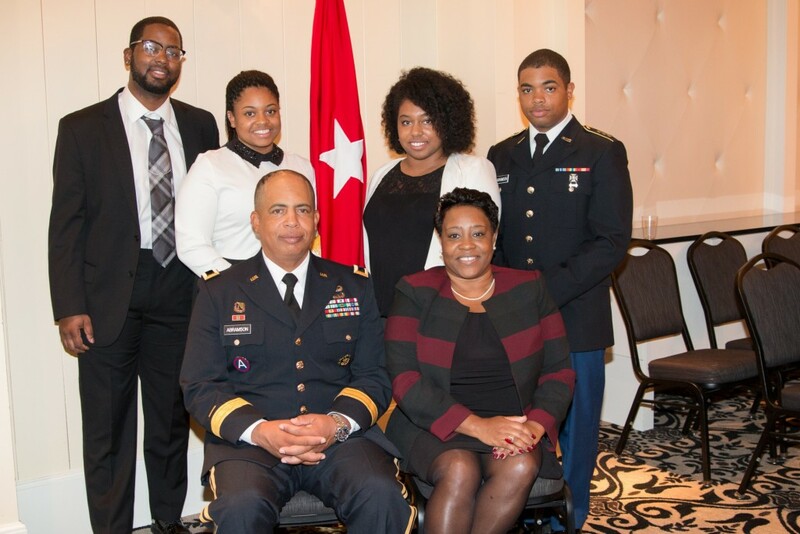 When I went to Virginia State University, on the way down, I had an aunt that was in the ROTC. She went to Howard. She said that ROTC will pay you money every month and there is an opportunity for a scholarship thru ROTC to help pay for school. I remembered that side conversation with her and not paying too much attention to it. So when I got to Virginia State, and if you know how when you can sign up for classes, here I am from New York, I literally carried the clothes on my back and within the time you still can enroll in classes, I ran out of money, I had no more money. 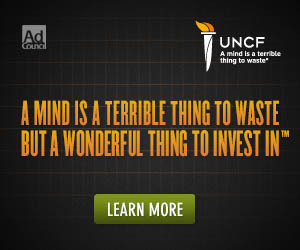 I remembered what my aunt said to me from the back of my head: hey, join ROTC, and you can get money. That was my mind set. I went to the ROTC building fully expecting– that is how naïve I was — fully expecting that if I signed up for the ROTC classes, that classes were still open, that how quickly I ran out of money– I was fully expecting to get some money from ROTC department. But there was a Sergeant Major there, Sergeant Major Prelue, who said, “listen, son, that not how it really works, but since you signed up for ROTC and are interested, I will guarantee you, it’s a relatively simple class, and it will help your GPA.” So that really got me on my path to ROTC. He was right, ROTC was a relatively easy class as you compare it to my chemistry classes. It was all about leadership, marching; so I stayed there for a year. 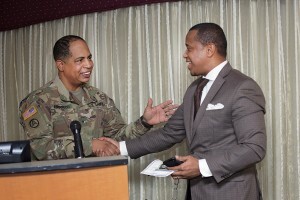 Sargent Major Prelue said afterwards…”So, listen, you missed your first year of ROTC as a freshman, (because I went to New York City technical college for a year before I came to. Virginia State), what are you doing for the Summer?” I said that I was about to go back to Brooklyn, (no job in sight). And he said, “Listen, since you missed your first year of ROTC your freshman year, you really need to make it up. We will send you to camp, eight weeks. We will pay you for it and then you can compete for a scholarship.” Sounded good to me! So I went to Fort Knox, Kentucky, in 1986. Went there for eight weeks, signed up to compete for a scholarship, won a scholarship at Fort Knox, Kentucky, which allowed for me to finish paying for my undergraduate degree at Virginia State University. Fast forward, 26 years later, there are a few other things between here and now but that put me on my path within the ROTC department and I just stayed on, I just loved it, it’s been great. HT: So how has your background in chemistry helped you along the way? GA: Chemistry helped so when I came into the military, they made me what is called a “Chemical Corp Officer.” Essentially, what we do within the Chemical Corp, we focus on the defense of nuclear, biological and chemical weapons. I have since transitioned to the Acquisition Corp, and Acquisition Corp talks about building capabilities for the warfighter. I’ve connected the dots. For the past couple of years, since 1996, when I switched over to the Acquisition Corp, I have primarily worked in the enterprise of the building of, and testing of, chemical defense equipment: nuclear detectors, biological agent detectors, chemical detectors. There is science behind each one of those technologies. I will say happily that my chemistry degree has helped me to understand the technology behind the development of, and building of, those detectors and devices that our warfighters use today. There’s some strong science behind it, and again, my chemistry degree has really helped me. Those folks that don’t have a chemistry degree, I am not saying can’t get it, I think they are at a disadvantage. There are a couple of books however, that can help them understand the science a little bit better. HT: What advice would you give to young people who are pursuing careers in the military? GA: I would say, as a father of four –my youngest son is going to enter into the military this summer– one of the challenges that I see in my children…. a part of this equation…is there is a greater percentage of younger children sitting in front of a television playing with X-boxes, their PlayStation, Sega, and play on their phones, and do very little physical exercise. So any military service— Army, Navy, Air Force, Marines— they will provide you with the education necessary to fulfill the job that you are going to do within that particular service. But there is also a physical component to that; specifically, within the Army, you have to do push-ups, sit ups, a two-mile run. And if you are going to come into the military, you have got to be physically-oriented. I am not saying that you have to be Mr. Atlas, or Wonder Woman, but what I am saying is that there is, too often, a shock to the body when doing physical and long-term strenuous activity. So, if you as a young person are interested in joining the military, you have got to make a concerted effort to become a little more physical…if not doing that already, some sort of physical activity, so that it’s not a shock to your system. GA: When the street lights came on, “You come inside.” Unfortunately some challenges within our society allowing children to stay outside all day may not be the safest thing, depending on where you live. So unless there is a network around that child– of parent, parents, or family members, and/or friends, that can take them to organized sports– if the child does not have that, not going to organized sport, they are not going to have that physical activity. The opportunity of getting some sort of physical activities is coming less and less. HT: On a personal note, do you have a roadmap to success that you can share with our readers? GA: There is not a particular roadmap that everyone can follow, it’s the same for everyone based off everyone has a different personality and characteristics. But I would say is don’t be afraid of success. I think often times that can be masked in a challenging event, or an objective that seems far or hard to achieve, that’s a masked achievement or masked success. Don’t be afraid of trying to obtain success or whatever that success or reaching for sometimes that is hard to obtain. The road to achieving that objective or that thing we define as success, the road to that will help shape future success so it will create a mindset that you will go after the things that are hard. Don’t be afraid of success. When things get a little bit difficult. What I want to say is to continue to move down that particular path, and don’t put it to the side when it gets hard. Success is difficult. Life is difficult. But if you lean forward into, you might see some benefits on the other side. HT: What are some of the things that you see for Picatinny? Making your institution more of a success, for example, in the area of STEM education? GA: One of the things that I quickly found out is that the work force– civilians, military, and contractor team– here on Picatinny are, number one, dedicated to the mission and very knowledgeable of their mission set – and especially the civilians have been doing this for a while and so if I am to say I am going to catch up to them in terms of the level of detail that they know in terms of working in this enterprise, I am short-sighted, meaning I will never catch up to them in terms of the knowledge base that they have. So then the question then becomes how I can, what can I, bring to the table, to say that I am an invaluable asset to the team called Picatinny. Where I see that I fill in is community outreach. I can help with that. I have the same knowledge base in reaching out to the surrounding communities and provide the narrative of the STEM outreach here on the arsenal. The opportunities not only for again the surrounding communities but the youth again in the surrounding communities and the cities around the Picatinny to bring what we do here on Picatinny and advertising the capabilities we have on the arsenal. An example that I would use is that if you go to Fort Bragg in North Carolina, you know that it is the centerpiece of the Army’s warfighter. So why can’t we have that same narrative? The same understanding of the capabilities here at Picatinny’? And the answer is, we can! One step at a time, getting the word out on the capabilities and dedicated workforce that is here at Picatinny. I think this is where I come in, I can … advocate and (be) an invaluable asset to the team. HT: On a final note…what, if any, advice would (you) offer to young people? GA: I have five points. 1. Education is number one! We hear that all the time. We try to tell the younger folks that all the time. If they continue to hear it, hopefully it will sink in over time. 2. Coming from being an Army officer, integrity is non-negotiable. It can’t be taken away, you can only give it away. Reading! Whatever you want to do, you need to read up on and be committed to the cause. For example, if you want to be in the Army, you may want to read up about (what) the Army entails and what you are getting yourself into and be committed to the craft of …your chosen profession …. Read about it and be committed to it. Writing: In anything we do, and coming from a military perspective, one of the things to be successful in the military and the civilian sector, you got to be able to communicate, clearly communicate what you want and what you need. Writing is another form of communication. And because of things like text messaging, there is a lost art of clearly articulating what you need in very clear and concise manner. If we don’t practice it, we lose it. I think that a lot of children are using shortcuts like “lol,” etc. So force of habit, it doesn’t get into grammatical subject-matter agreement in sentences. So writing is important. And the last R is for is running. We must have some sort of physical activity, that is not only important in the military sector but in the civilian sectors. In terms of having a healthy lifestyle. You got to be able to run in everything that fits under that umbrella of running. Really, this just means being active. HT: Thank you so much. It was a pleasure!